I didn’t know exactly what to expect when I picked up A Long Way To Begin. I certainly wasn’t expecting what I got, though! Abacu5 bridge the gaps between country, hard rock, and ’80s flair. Their songs have a driving backbone that’s exciting and promise surprises beyond every horizon. There’s something truly epic about the sound Abacu5 have developed, and A Long Way To Begin is exemplary of the band’s talent and style. There’s a lot of emotion in songs like “Dark Rain” as Randy White’s voice floats between thick vocal choruses and screaming guitar lines. 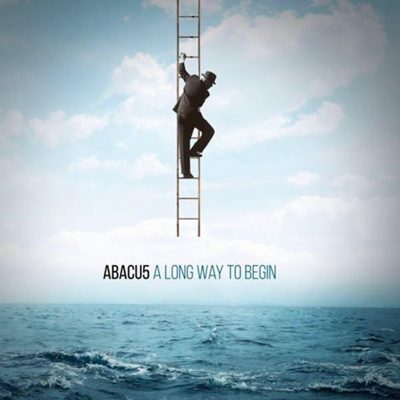 Abacu5 know how to build just the right amount, and their quick releases are perfect counterpoint to the heavy churning of guitar chords and bass kicks. Each song tells a new story, sung out through rays of melody, over simple yet potent drumbeats and the warm fuzz of guitar and bass. The guitar solos on A Long Way To Begin are full of personality and really are the icing on top of the cake — a cake baked entirely from rock and groove. The solo in “Tightrope” made it the highlight of the album, reminding me as much of Led Zeppelin as of Minus the Bear. This is a diverse collection of songs, especially considering that they run 55 minutes long. The album balancing guitar riffing, thick vocal tracks and just enough head-banging groove to satisfy. The result is an appropriate amount of instrumental sections and great lyrical melodies in-between. When I first read over the song titles on A Long Way To Begin, I thought they all seemed generic. I swear that I’ve seen other bands with songs named “Pretty Lady” and “Love of My Life,” but when I noticed that the latter had a running time of exactly 4 minutes and 20 seconds, I began suspecting a deeper motive behind how Abacu5 names their tracks. Regardless, their music is strong enough to back up whatever they want to call it, and that’s what matters.